Come and try all the wines, cider and bubbly available for tasting and purchase at Glen Arbor Wines. Big Apple, creamy mouth-feel, with a fresh crisp off-dry finish makes this wine an ideal pairing for a large variety of cuisine. 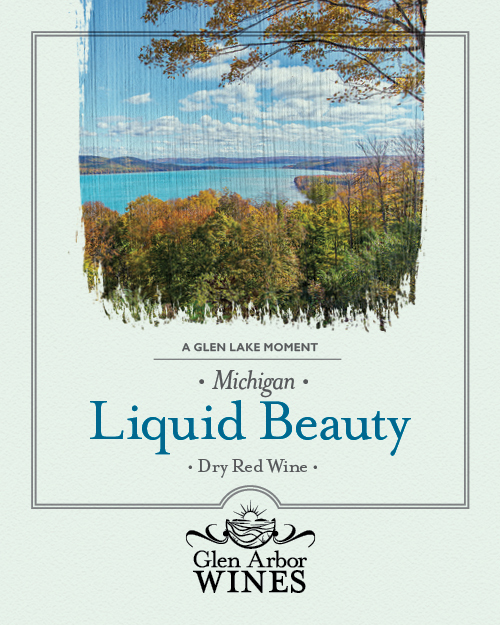 We recommend pairing this wine with fresh Leelanau Herbed fromage and some tasty locally baked bread. White peach from beginning to end, our Sparkling Riesling is delicious. Slightly sweet up front with a nice clean finish, we recommend pairing this wine with a mild blue cheese with local honey on a warm baguette or a slightly spicy Asian dish. Bright citrus notes on the nose and palate. This Pinot Grigio is fresh and crisp with a nice weighted mid-palate. It is a great complement to our area’s local fresh Whitefish or perhaps a summer salad with local greens, strawberries, and goat cheese. salad, grilled pork or chicken, or a light seafood pasta. Barrel fermented and rich with oak flavor, this Chardonnay is certain to please those looking for a richer style chardonnay with aromas of vanilla and juicy apple and pear. We recommend pairing this wine with a creamy baked brie with pecans and brown sugar, a wood smoked pork tenderloin, or a cedar plank grilled salmon. Our sweet Riesling has stone fruit aromatics with hints of petrol, often fooling some into thinking it is a German Riesling. The sweet finish is followed by a clean acidity leaving your palate feeling clean and refreshed. This wine will be a perfect pairing to a spicy tuna roll with avocado, a blackened whitefish with mango salsa, or a lovely piece of Humbolt Fog cheese. Semi-dry in style, this fruit forward rose wine has aromatics of strawberries and bramble fruits. The fruity nature of this wine makes it a delight to drink a chilled glass while watching the sunset on the beach. A dry red blend of French hybrids and local vinifera, our liquid beauty blend has a light to medium body with a dry finish. The fruit notes upfront might remind you of an Italian table red but the finish has more Earthy notes. It is a great compliment to a dry hard cheese such as Mahon or Parmesan. It would also pair well with some grilled lamb or duck. Aromatics of cherries with hints of herbal notes make this Merlot tantalizing and desirable for consumption. The round weighted palate with the balanced tannins make this wine a delight to drink. We recommend pairing this wine with a grilled marinated skirt steak or a portabella burger. The nose of this wine will remind you a delightful French beaujoulais. The dominant grapes in the blend are related to the famous Gamay Noir and thus create a lovely drinkable dry fruity red wine. We recommend serving this wine at room temperature or with a slight chill on a hot summer day. Our Farmstead Red is a wonderful pairing with barbecue, pizza, and burgers. Made with 100% Michigan grown apples, we add Citra hops to create a dry style cider that appeals to a hard cider consumer as well as a beer consumer. This is a cider that will keep you coming back to fill up your growler before and after a day spent lounging on the beach on Lake Michigan or on a patio enjoying time spent with friends.